I hate chemicals in my water. I hate the smell, and I hate the taste. I know, in today's world, it's a near-hopeless cause. Our bodies are infused with chemicals from so many sources, it's tempting to simply throw your hands in the air and give up. The Katadyn Hiker water filter, however, offers you at least a tiny victory in the war against chemicals, at the cost of 11 ounces. 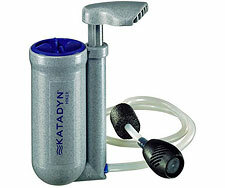 Using a 0.3 micron glass fiber filter, the Katadyn pumps out clean water without adding any chemicals to the mix. There are, as always, a few things to keep in mind. First, filtration is effective only against bacteria, protozoa, and other living organisms. Viruses (ie, hepatitis) will pass freely through the filter—they're just too small to be trapped. While viruses aren't normally a problem in the backcountry, international travelers will need to find other solutions for maximum safety in populated areas. Compared to the nearly-weightless Aqua Mira (the current chemical treatment darling), the Katadyn filter adds a non-trivial 11 ounces to your pack weight. After use, the cartridge does hold a little water, which boosts the weight up another ounce or two. And, in winter, that water is likely to eventually freeze, rending the Katadyn Hiker unsuitable for 4-season use. You may find pumping water a little tedious at first, but with practice you can treat about a liter per minute, making this a fast way to purify a lot of water. One microfilter cartridge will last for about 200 liters of water or so, which does introduce the issue of maintenance costs. However, for your troubles, you'll be rewarded with clean and clear water, with no chemical aftertaste and no sediment or other nebulous floating debris to worry about. I've used the Katadyn Hiker extensively for many years now. It is absolutely my preferred method of water treatment. Compared to the current available options, the Katadyn offers the most compelling set of benefits with the least amount of negatives. Ultralight backpacking fanatics won't like the extra weight, but for everyone else, this is an easy pick.